Russian Minister of Defense, Sergei Shoigu, has made the decision to replace soldiers with robots. The military is planning to expand the use of robots for mine-clearing and dealing with emergency situations. According to preliminary estimates, the implementation of new technologies for munitions disposal and the “robotization” of most life-threatening military operations will not only help save the lives of soldiers, but will also save 75 billion rubles ($2.4 billion) over the period 2012-2014. Resolving this problem is considered one of the priority tasks for the Russian Ministry of Defense. Russian Defense Minister Sergei Shoigu chaired a working meeting recently at the Leader Center for High-Risk Rescue Operations, where he demonstrated the capabilities of robot technology. The military was, by all accounts, impressed with the mine-clearing machines. Chief of the General Staff, Valery Gerasimov, proposed the implementation of these machines in Chechnya. The Ministry of Defense expressed interest in snow- and swamp-traversing vehicles, as well as in the Yel-10 and Yel-4 firefighting complexes. The LUF-60 mobile firefighting support unit, which has already been used to put out a fire at an ammunition depot, is also of interest to the ministry. The Ministry of Defense is planning to purchase all of this equipment in the immediate future. This will be the first time that the Ministry of Defense has bought “civilian” robotic equipment. Before Shoigu joined the ministry, the military was only interested in combat robots. 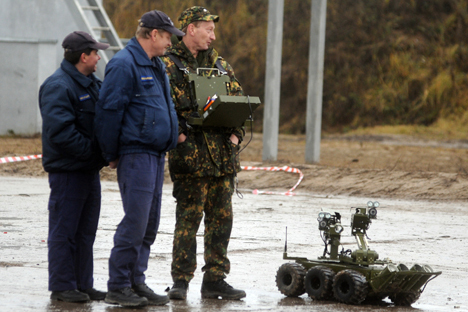 Testing of the multipurpose MRK-27 BT (“Point of Combat”) robotic soldier, which was developed by the Applied Robotics Laboratory of the Bauman Moscow State Technical University, has been underway since 2009. The robot was created to ensure that combat tasks are executed in situations where fatalities are highly likely. The MRK-27 BT is similar to the American SWORDS robot. The Point of Combat is a mobile track-type chassis with an entire arsenal of assault weapons mounted on it: a Pecheneg machine gun, two RShG-2 grenade launchers, two Shmel flame-throwers and six smoke-screen grenades. The 440-pound robot is radio-controlled and can be operated at a distance of up to one kilometer (just over half a mile). The machine is armored and can withstand explosions the equivalent of 800 grams (6.5 cups) of TNT. A global positioning device will be installed on it in the future. Robots are more widely represented in the navy. The Ministry of Defense has placed an order for eight Gavia Autonomous Underwater Vehicles manufactured by the Icelandic company Hafmynd. Gavia looks like a conventional torpedo, but it can be used to detect and defuse mines, as well as to patrol. Dmitry Rogozin, deputy prime minister in charge of the defense industry, has called the creation of robotic equipment for the Ministry of Defense a promising area for the development of weapons and military hardware. In one of his latest initiatives, Rogozin promoted the establishment of the Fund for Advanced Research (FPI), along the same lines as the United States Defense Advanced Research Projects Agency (DARPA). The deputy minister even managed to submit an FPI bill to the State Duma and announced it as a priority. The military is following suit. The official website of the Ministry of Defense recently posted an invitation to tender for the development of new types of weapons and military hardware. Private companies already hold a monopoly on the supply of tactical drones to the Ministry of Defense: now they have been invited to dabble in robotics.